SCIENTIFIC CALCULATOR - simplexetys Webseite! You can define variables in a dialog table or directly in the form. 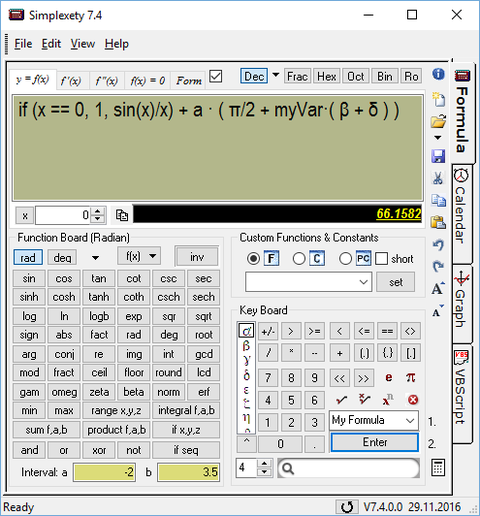 It can deal with anything from trigonometry to square roots, and its graphical features are fantastic and very easy to use, creating simple functions in minutes. It remembers every result used on start-up to when you close the program, too, using the awesome History feature. One of the best you will find. The program supports e.g. symbolic derivation and a lot of other numerical functions and null crossing. 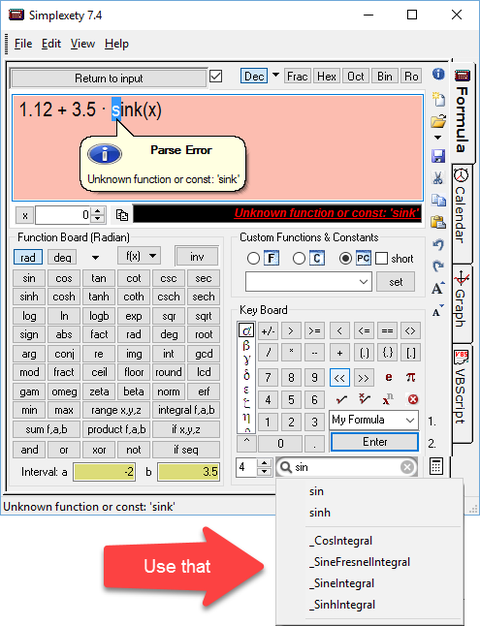 If there is a fault on a formula string, then the program opens a separate window where you can see the position and the reason of the error (see the picture on the right). You can also search for the right function names. As you can see, simply type in a name like 'sin' and a list of similar function names appears in a popup menu.